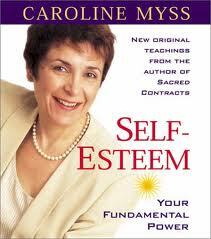 Five times New York Times bestselling author, Caroline Myss, is one of my heroines and greatest teachers of higher self-esteem through inner healing. Caroline was educated by priests and nuns until she was 29. Her ability to equate physical, emotional, psychological, and spiritual problems with disease has been one of the keys in my personal discovery on how to stop bulimia. I have recommended her to countless people looking for bulimia help, and am so excited to recommend her here so that you too can experience the benefits of her emotional energy healing work. Read her self-help books for women, listen to her CDs, and watch her DVDs to find out how you can remove internal stress by changing the way you perceive your body and its infinite ability to heal. Watch this incredible video clip on why people don’t heal and how they can remove emotional barriers that keep them stuck in their addiction or suffering. Medical Intuitive Caroline Myss has helped people from all over the world improve their self-esteem through her work with consciousness, spirituality, mysticism, and her insights into healing and well-being. She founded her own educational institute in 2003, Caroline Myss Education (CMED), where she created a wide variety of programs for personal development, [emotional, physical, spiritual] healing, and personal transformation. Dedicated to helping people release what keeps them from optimal physical and emotional health, Myss produces an average of 10 books a year, all dealing with holistic health and the mind/body connection. Her interest in how stress relates to disease makes her a no-brainer for getting help for bulimia. What could be better than the collaboration between a medical intuitive and a traditionally trained doctor?! The two make a stunning case for the relationship between emotional dysfunction and physical illness and the role that our deepest fears and problems play in creating dis-ease. After reading this book I understand from these self-help authors about the reasons my 20 year food addiction lead to my disease and emotional breakdowns. The key to greater self-esteem is empowered thinking. In this book Myss identifies eight dysfunctional patterns we create that lead to our illness. Myss teaches you that your “negative attitudes create negative responses within the physical body” and when you can re-wire your attitude, you can make changes toward health once you identify your emotional, psychological, and spiritual stresses. There are fascinating chapters that discuss specific diseases in light of lifestyle factors, stress, and psychological patterns and energetic factors. Just one example is that of a heart attack which Myss says is “an explosion of energy attempting to break down an emotional barrier … caused by warehousing fears and anger,”. Wow! This is a great DVD that comes with its own study booklet. Complete with computer graphics, Caroline Myss guides us through the seven chakras, showing us how the body’s energy centers are keys to generating healing and a permanent state of wellness and balance. Watching this DVD I learned more about my connection to the divine and how I can remove my obstacles to healing by focusing on cleaning unseen energy blockages in my body. Myss gives us daily practices for healing and growth as well as gaining a new vision of the body and its infinite potential. This DVD is a terrific tool for releasing bad habits like binging and purging. The Energetics of Healing is highly recommended if you’re interested in overcoming an eating disorder like bulimia through greater study of your body and energy. Click here to order The Energetics of Healing and to begin thriving in recovery through the study of healing your energetic body.